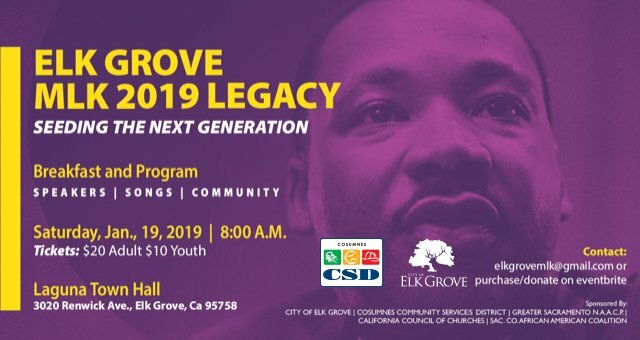 As part of regional celebrations honoring the memory and legacy of Dr. Martin Luther King Jr., a breakfast service will be held in Elk Grove. The service will be held on Saturday, January 19 at the Laguna Town Hall, 3020 Renwick. The networking session will be held at 8 a.m. Speakers, songs, and speeches will start at 9 a.m. The keynote speaker will be Dr. Flojaune Cofer, Ph.D., MPH, Senior Director of Policy for Davis-based Public Health Advocates. Sponsors of the event include The Great Sacramento NAACP, California Council of Churches, Sacramento County African American Coalition, the city of Elk Grove, and Cosumnes Community Services District. Tickets to the event can be purchased in advance here. More information is also available at via email at elkgrovemlk@gmail.com.